What kind of message do we present about the Christian life? Some Christians do give the impression that by casting our lives onto Jesus we will discover new found health, wealth and happiness. If faith in Jesus means that we become able to overcome the disappointments of life then that message is one which will go down really well on the street. So are Christians richer, healthier, happier people? Well the answer is both yes and no! Yes, Christians should be people who work hard and who take their commitments to work and family seriously. Christians will take a dim view of wasting money on drugs, will not be drunk every night of the week and they will hopefully not spend too much of their free time down the bookmakers gambling away their hard earned cash. Because they take seriously their marital vows they will stand a good chance of avoiding certain particular lifestyle diseases, stress and costly payouts to divorced partners. From this point of view Christians are on the road to success! However this is not the whole picture. Christians will find that they are just as likely to be run over by a bus as anybody else. Christians in Bedford are just as likely to suffer from cancer and many other physical setbacks. Faith in God will not protect us when an employer makes the workforce redundant or when we share any other similar fate to our community. It gets worse! Not only are Christians not immune from the daily grind. Jesus tells his followers that for them there will be a calling to a life which can bring suffering and even premature death. Jesus is quite clear to his disciples in the passage today. He will not allow them to go out and preach a soft option. Being a Christian will not make life easier, it is actually about a life of denial and hardship. I love the Lord, because he has heard the voice of my supplication, because he has inclined his ear to me whenever I called upon him. Not many of you should become teachers, my brothers and sisters, for you know that we who teach will be judged with greater strictness. For all of us make many mistakes. Anyone who makes no mistakes in speaking is perfect, able to keep the whole body in check with a bridle. If we put bits into the mouths of horses to make them obey us, we guide their whole bodies. Or look at ships: though they are so large that it takes strong winds to drive them, yet they are guided by a very small rudder wherever the will of the pilot directs. 5So also the tongue is a small member, yet it boasts of great exploits. Jesus went on with his disciples to the villages of Caesarea Philippi; and on the way he asked his disciples, ‘Who do people say that I am?’ And they answered him, ‘John the Baptist; and others, Elijah; and still others, one of the prophets.’ Jesus asked them, ‘But who do you say that I am?’ Peter answered him, ‘You are the Messiah.’ And he sternly ordered them not to tell anyone about him. For the first human admission of who Jesus is, Mark shows Jesus travel from Lake Galilee to the villages of Caesarea Philippi. Caesarea Philippi had originally been called Baalinas. It was the place where the worship of Baal was centered. Then it was called Paneas, a place where the Greek god Pan had been worshipped. Finally it was known as Caesar’s city, because Philip had built there a tremendous white temple to the godhead of Caesar. It was also known as the source of the Jordan, Jesus is in the shadow of this great city, upon him look down the gods of Palestine and Greece, the history of Israel and the might of imperial Rome. In this shadow of greatness, Jesus the poor Galilean carpenter, asks his sorry bunch of disciples who they think he is. Peter shows that God has been at work in his heart and he is able to recognises that Jesus was ‘The Christ, the Son of the Living God.’ Jesus tells Peter that God has revealed this to him, and he calls him a ‘rock’ on which the church will be built. This means that Peter is the first person to discover who Jesus is and everyone who follows and makes that same discovery is another stone built on this foundation. Jesus does not want this message to be published at large at this time, in the 70 years before Jesus there had been 17 rebellions in which 57,000 Jews were killed. This was not time for another blood bath, and Jesus had a different plan. However Jesus at this point has reached a watershed, there was at this point that moment of no return. Jesus from here makes an inevitable journey to the cross. William Tyndale gave the Bible in English to the English people. The church of the day did not want the common people to have the scriptures and they burned his Bible. Tyndale said, ‘no doubt they will burn me too, if it be God’s will.’ It was eight years before they did eventually burn him, and he waited those eight years for his death. Jesus was in this mould. He knew the danger and what lay ahead and he refused to be put off course. This was not a particular gift of fore knowledge, anybody in their mind would know that if Jesus went to Jerusalem and continued to say the things which he was saying then it would end in his death. The Roman Empire was strong and powerful yet Jesus was completely lacking in awe of worldly power or values. Jesus created his own values. life for my sake, and for the sake of the gospel, will save it." Today we seek to model ourselves on Jesus - When surrounded by the power of influences which surround us. Are we able to live independently by God’s values and not conform to the world around us? Would we be prepared to do so if it brought us directly into situations of conflict? Are we prepared to consider and think through our ideas and values, to make sure that we are being transformed to live more like Jesus wishes us, rather than conforming to the prevalent opinions of our day? This is so difficult in our time because we are surrounded by powerful influences which tempt us to have a distorted view of life which is not according to the teaching of Jesus . We do not live in the shadow of Caesarea Philippi but there is substantial pressure from powers about us. We are called to be in the world, not to retreat into solitude like the pillar saints, but to be in the midst of the chaos of our society. In the shadow of the malevolent forces which seeks to corrupt us and are society are we prepared to stand against the tide? Are we prepared to say like Jesus that if we seek self fulfilment we will never be fulfilled. Jesus tells us that it is only as we serve and give to others that we are truly filled. Is it any wonder that our society is so lacking in fulfilment? "Those who want to save their life will lose it, and those who lose their life for my sake, and for the sake of the gospel, will save it." To be a Christian is not for the faint hearted, nor even for the strong, but only for the faithful, who dare to trust the Lord. Lord Jesus we pray that your Spirit would lead us and guide us as we seek to follow you and place you at the centre of our lives. Your love urges us to have confidence in your promise that we are a new creation. May we know in our hearts the reassurance of sins forgiven and our future safe in your merciful keeping. King of love we praise you that no matter what circumstances may come upon us we are always in your presence and that you walk with us wherever we go. Help us to trust you in all things and through all things and may we be an optimistic people dwelling in the comfort and knowledge that we can entrust all of our future to your safe keeping. We pray that our lives would be lived as witnesses to your kingdom. May your seeds planted in our lives bear witness to your saving grace. Help us to make our souls places which are fertile fo the growth of your word. Through us may your kingdom be demonstrated to your glory as we share your grace and love. We pray that you would direct and govern your Church, that we might be your living presence in our community. May your kingdom grow and your love be known that justice and peace may reign. We pray that you would inspire our church leaders that they might speak your words to our generation and lead us in truth. We pray for Jeremy Corbyn as he takes office as the new elected leader of the Labour Party and we pray for all in political office as they exercise government. Especially we pray for all of those in the decision making process over how to respond to the mass movement of people across the Middle East and into Europe. Give them compassion and understanding to tackle those underlying issues which have caused so many people to flee their own countries. Forgive us our part in the destructive violence seen in dysfunctional countries in the Middle East and northern Africa. You have called us to welcome the stranger and love them as ourselves, so may your church show leadership to respond with love and care to the humanitarian crisis. Help us also to prepare for the long term commitment and the implications of the responses we which offer. Look with compassion Lord Jesus of the anguish of our troubled world. We pray today for those facing adversity and all who are in need of your love and grace. We think of those facing financial hardship and an uncertain future. Those who are weak and frail and troubled by physical weakness. May all who are insufficient in their own strength find their strength in you. Lord Jesus your touch changed the lives of all who turned to you, so now hear the cry of all who cast their anxiety onto your loving care. Heavenly Father your glory unites earth and heaven. Gather to yourself those who have died and grant eternal life to all your children, bring us through the waters of death to life eternal. Jesus Christ is the light of the world, a light which no darkness can quench. We comment to your merciful keeping ..... May the souls of the faithful deprated rest in peace and rise in glory. Amen. to live in a positive way. Amen. renewed in body and spirit that we might more worthily serve and adore you. We ask it in Jesus' name. We are on the way again Lord - the time of busyness. The time of new schooling, Of new activities in church and in the community. We ask you to bless our activities - our special services - our ways of doing things, our volunteers - and those who continue to serve as faithfully as they have for many years.... Amen. Lord God, may the sight of your creation - from the vastness of mighty stars and planets to the lowliness of the smallest living creature that I can see - inspire me to grow in wonder and awe, in reverence for life, and in appreciation of the people I meet and of all creation. The passage from Mark today is all about recognising who Jesus really and what that means for his followers. There are three ways we can look at the passage, what it means for Jesus, what it meant for the disciples and what it means for us. Jesus is nearing the end of his ministry, he is about to be killed and there is an evaluation of how well he has communicated his teaching. John the Baptist others as Elijah or a prophet. Then Jesus asks them directly what they think. Peter was always quick to respond and in the words of our reading today he calls Jesus the ‘Christ’ The word "Christ" is a Greek translation of the Hebrew word "messiah." The expectation of a "messiah" in first century Israel was that the messiah would sweep in and bring about the promised Golden Age. The messiah would be like King David, and would destroy Israel's enemies and bring peace and prosperity to the land. We could understand Peter stating this very traditional Jewish teaching. The Messiah was one who would usher in a climactic day of God’s deliverance as a mighty warrior. One capable of returning Israel to independence, free from Roman oppression. He would understandably be shocked that Jesus interpreted Messiah as meaning somebody who would instead see the role as meaning one who suffered. Jesus speaks of himself as the "Son of Man" one who would suffer and be killed. Peter will have nothing of it and reprimanded Jesus for having said it. Peter wants to hear nothing about the Son of Man being rejected and killed. He is still fixed on the idea of a triumphant and strong Messiah who would overpower the authorities; not suffer and die. It didn’t fit his view of how God would save the world. Peter rebukes Jesus for not being the kind of saviour that he wanted. In return Jesus uses the strongest language and calls Peter “Satan.” The disciples had failed miserably to understand Jesus teaching. God’s presence would not be found in powerful deeds and military might. The power of Jesus would be revealed in his risen life, but this only came through a life lived in weakness, suffering and death. Note that Jesus calls the disciples and the crowds to gather round and makes clear that he is giving instructions which are for everyone. If they wish to live his risen life then they must follow his life of service. They must learn to copy him and deny their own selves, take up crosses, and follow. The words at the time would have had stark meaning. Having seen hundreds and thousands who had received the death sentence the crowd knew well the sight of individuals walking the roads carrying their own wooden crosses upon which they would be nailed and killed. The message at the time would have been chilling, there were no cute songs ‘the old rugged cross,’ if you followed Jesus you should expect to go to the same fate as the condemned Jesus, literally carrying their cross for their own crucifixion. 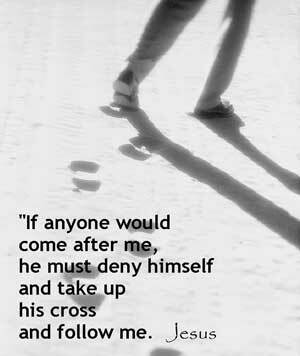 We won’t most likely be asked to carry a cross, or to literally die for our faith. However we are called to be radically different in our lifestyles, to live in a counter intuitive ways to the norms of society. Like Jesus, like the disciples, we are requires to deny our own needs and desires. To put ourselves aside for the sake of greater values. It is giving up ourselves for others, in the way of sacrifice and unselfishness. It is giving up particular interests or time or possessions when the purposes of God require it. It is letting the will of God take the place of our own will. It is putting God, not ourselves, at the centre of life. The people who listened to Jesus were right to recognise him as the Messiah, the Christ. He was not a forerunner, somebody sent to prepare the way, he was the way. He was the fulfilment of all the hopes and dreams of the Jewish people. God had kept his promise, he had sent in Jesus not a prophet, not a person to speak about what God was like, it was God himself in human form. It was most wonderfuI. The Jews who heard Jesus and who recognised who he was could have been forgiven for assuming that this meant that as Messiah Jesus would be the one who would raise Israel up from under Roman occupation and restore her fortunes as a nation. The role of Messiah had military and political expectations which they could justifiably expect Jesus to carry out. The air would have been filled with excitement at being in the presence of one who was about to reverse the fortunes of the downtrodden Israelites. Peter and disciples must have had in their minds episodes from the history of Israel, such as when Moses freed the people from Pharaoh. Once more God was about to do a great thing and the opportunity to be a part of it must have been elating. Imagine the disappointment then when Jesus acknowledges the fact that he is the Messiah, but then says he is going to be captured and put to death. How on earth could they convince anybody to follow a leader who was already predicting his own failure and demise! Jesus insists on honesty, they must not lead anybody into false expectations or misguided hopes. Anybody who wanted to follow would be a part of a movement which was destined to suffering and hardship. The disciples found it almost impossible to understand Jesus. Later we read that Jesus gathered his disciples together and made his teaching really explicit. He broke bread as a visual aid, to help them understand that his body was going to be broken. His blood was going to be poured out, just as he gave them wine to drink. The disciples found such ideas beyond comprehension, they wanted the inauguration of the Kingdom of God, the new Golden Age. This is an important to lesson to learn, for many are deceived in their faith by imagining that faith in Christ acts like a barrier against trial and tribulation. Some are wrongly advised that the trusting soul is not occasioned by adversity to the same degree as those who live without the Christian religion. How easy it would be to stand in the pulpit and declare that the act of faith works to bring health and wealth and immunity from the dangers which trouble others. How easy and yet how false. Nobody could accuse him of trying to pull the wool over the eyes of potential converts! We must not expect special favours from God because of our faith. Christian commitment does not grant us immunity from the pains of life associated with our mortal bodies and a fragile planet. A most cursory glance at the misfortunes which afflict the lives of people across the world from Darfur to Iraq, must convince anybody with half a brain, that God is not in the business of sparing people from even the most dreadful atrocities. The idea that we worship a God who will through our prayers reward us with new jobs or girlfriends, whilst being seemingly oblivious to the plight of millions who seek only enough food and water to remain alive, is simply ridiculous. Such belief turns God into a monster from whom we would do better to run away than to fall down and worship. 1. A woman went to St. Francis of Assisi and asked what she had to do to be forgiven for her gossiping. St. Francis told her to take feathers and place one at the doorstep of everyone she had spoken ill of in the town. She did so and returned to the wise saint. Francis told her to then go and retrieve all the feathers. When she attempted to do so, they were all gone. By that time the feathers were scattered all around town. Once again, she returned to St. Francis and told him about the feathers. He said to her: You wish to repent and be forgiven of your sin. Good. But the damage of your words is done and cannot be taken back. 2. There is a story told about the great psychiatrist Viktor Frankl. After giving an address in Melbourne, he was given a boomerang as a gift. He commented that the boomerang reminded him of our human existence. People assume that the function of the boomerang is to return to the thrower, he said. But it is the real function of the boomerang to hit the target and to return to the thrower only if it misses the target. The same is true for life. We return to ourselves, to become self-absorbed and preoccupied, only if we have failed to find meaning in life. The meaning of life is to move out beyond ourselves, beyond our own meaning, and therefore find meaning. If we live only unto ourselves, spending money only for ourselves, squandering our time and our strength only on ourselves, focusing chiefly on ourselves, life boomerangs and comes back to us with only ourselves to show for it. 3. About this time of year people of the Jewish faith will celebrate the feast of ‘Rosh Hashanah’. The words in Hebrew mean “beginning of the year”. On the feast of ‘Rosh Hashanah’, people celebrate God’s creation. During a festive meal, pieces of apple dipped in honey are eaten. It is an expression of hope for a sweet and pleasant year ahead. ‘Rosh Hashanah’ is also the first day of a ten-day period of reflection, asking God’s forgiveness for faults of the past, promising to approach things in a better way in the year ahead. On this day, a ram’s horn - called the ‘shofar’ - is blown. The time of Jesus’ passion is coming to a close. He knows it is, but as yet his disciples are ignorant about what will happen. Soon, it will be time for Jesus to take them up into the hills where they will experience his transfiguration. Up to now, Jesus’ work has entailed travelling around, teaching, preaching and healing. But this passage indicates that things are to change and Jesus is starting to want to prepare his disciples for the changes. He asks them ‘Who do you think I am?’ and is told who others have said he is. However, Jesus wants to know what they think, not what others have said. This is to remind us that we stand before him on a one-to-one basis, God does not deal with us through a third party. Yes, of course, Jesus is our mediator, but since he tells us that he and the Father are one (John 17), then that does not alter the relationship. From the passage in Mark, it is clear that Peter has started to understand things more clearly than the other disciples do: he is the one to say that Jesus is the Messiah, the Anointed One. This was the person many Jews had been looking forward to, the one who would set them free. The trouble was that they were expecting a great leader who would conquer their enemies. Jesus, of course, was a Messiah in a different way. In verse 33 we can see that Jesus had his mind set on divine things: on the Church that he was founding, and on how the remainder of his earthly ministry would be pointing to the setting up of that Church. On April 16, 1889: a baby boy Charles was born in East Lane, Walworth (London), to music hall performers Charles and Hannah Chaplin. His parents parted company within 5 years and he had a difficult childhood, attending a school for orphans and destitute children. His father subsequently died and his mother was placed in an asylum for the insane. Yet Charles Chaplin grew to become and amazing star of films across the world. It has been said that his odd little tricks of manner and his refusal to do the most simple things in an ordinary way were essential features of his method, which thus far has defied successful imitation. His work was acknowledged when on March 4 1975 Chaplin was knighted by Queen Elizabeth. He died on December 25 1977 at his home in Switzerland. From time to time, one of Charlie Chaplin’s silent films is shown on TV. He was a small man, with a moustache and a hat and walking stick, and a funny way of walking! Because he was very popular, Charlie Chaplin look-alike-competitions were held, and people would line up and be judged on who looked most like Charlie Chaplin, walking like him and doing tricks like him. One day, just for the fun of it, Charlie Chaplin himself entered one of these “look-alike” competitions. He didn’t win - he came third! In Romans 8:28 we read In all things God works for the good of those who love him, who have been called according to his purpose. For those God foreknew he also predestined to be conformed to the likeness of his Son, that he might be the firstborn among many brothers. There is a sense therefore in which we are all called to be ‘look-a-likes’ We are to copy the example of Jesus, his life of love and compassion. We are challenged to ask ourselves, ‘When God looks at me, how close might I be to the true person that he calls me to be, being made in his own image and likeness?’ What changes do I need to make in my life that I may succeed in the real “look-alike” competition? We are called not to be like other human beings, but rather to be like Christ No matter how humble our beginnings, or what difficulties life might throw at us, God encourages us all to achieve to the likeness of Christ. the painful path of hope he trod. unless in caring works made known. the presence of undying grace. in the gift of your Son, our Saviour, Jesus Christ. Amen. Wonderful God, Almighty Redeemer - you have declared your love for us not only in words, but in deeds. We thank you for the love you have revealed through Christ Jesus, our Lord and for how you have granted us by his death and resurrection victory over the sin that is in us and in the world. We praise you for inviting us to be a part of your family and for reaching out to us when we have wandered from the path. Be with us this day as we worship you and listen to your word. Grant that we may be renewed in body and spirit that we might more worthily serve and adore you. We ask it in Jesus' name. Amen. God, the source of all health: So fill my heart with faith in your love, that with calm expectancy I may make room for your power to possess me, and gracefully accept your healing; through Jesus Christ our Lord. Amen. Inspire me, Lord, so that I may reflect your image and likeness a little more clearly each day. Amen.